Published on June 14, 2018 by Mecha Panda Publishing. I received a copy of this novel from the author in exchange for my honest and unbiased review. REVOLUTIONS HAVE ALWAYS QUESTIONED WHAT IT MEANS TO BE HUMAN, BUT THIS ONE IS ASKING WHAT IT MEANS TO BE A MACHINE. The creation of the twelve skyward cities did more for mankind than the renaissance of old. With them came a new species created to serve the ideals of the future. To Calista Ridley, an android is an android, just like heroes are little more than fairy tales. She knows the world is far from perfect, and that human nature is not something to be proud of. But she also sees the storm forming on the horizon. As a pilot of Voltza, her past decisions are set to shape the future in a way no one could have predicted. The lines between man and machine are blurring at a rapid pace. Innovation never comes without a price. 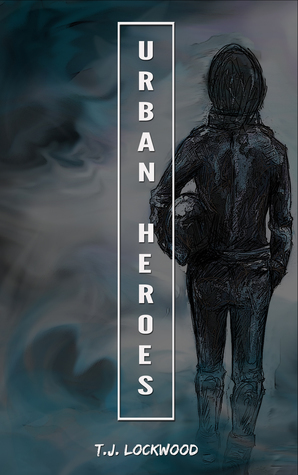 Urban Heroes was my introduction to Lockwood's series. At first, I didn't realize it was part of a series. I was pretty upset that there weren't more details about certain aspects and I felt like I was just thrown into something that I could never figure out. I almost decided not to review it. Thanks to GoodReads, I realized that this is the second in the series. Once I saw that, I was able to appreciate the book for the wonderful thing that it truly is. For the second in a series, it does a pretty good job as a standalone novel! I absolutely loved Calista. It was so good to see a female MC that thought for herself and was willing to do whatever it took to get through. This included pain, anger, and betrayal. She took all of these in stride and just kept on keepin' on. Despite her "survivor" attitude, she had a soft side to her as well. She could have easily walked away from the friends she makes along the way, but she is dedicated to the ones she loves. Lockwood brings some wonderful points to the minds of her readers. With all of our technological advances, where will we stop? With drones on the battlefield, the idea of androids similar to those in the story are not that far off. Will we begin to play god? Now that I know this was the second in the series, I will have to make time to read the first. I feel like a little back story could go a long way with this piece!